"Kelly is ethical, intelligent and knows what it takes to balance the needs of a community while addressing the preservation of the environment the community lives. Do not miss your chance, Kihei. Vote Kelly King in!" 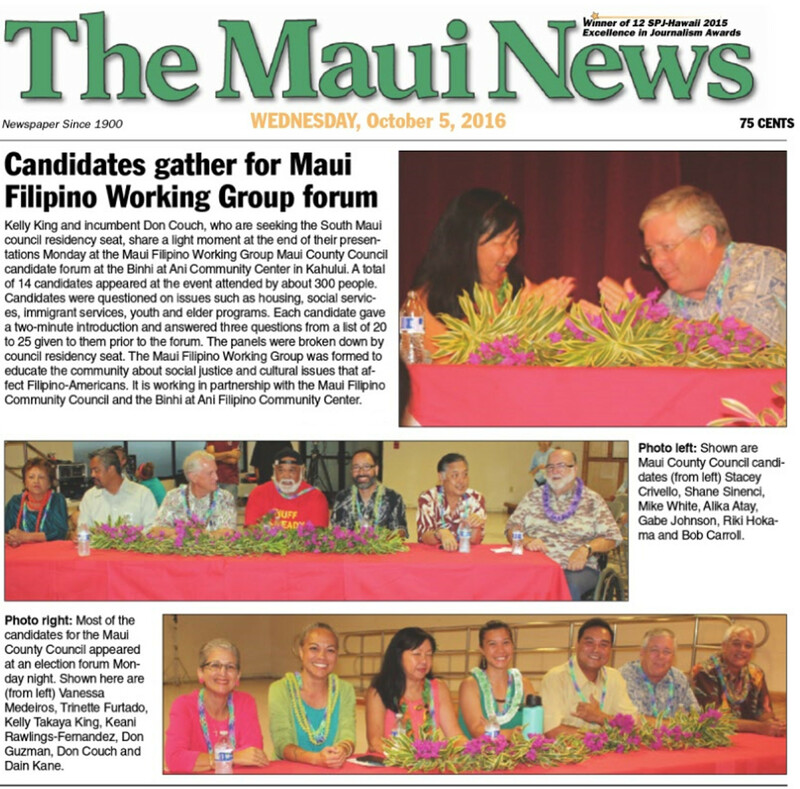 "A thousand thank yous, Kelly, for stepping up to the plate to help steer our county in a pono direction! ….I'll say it again. We as a community are so lucky to have someone with Kelly's ethics, experience, skill and passion to volunteer for such a difficult job! We must all stand behind her in the upcoming primary." "I have always admired Kelly. We first met as fellow students at La Colina Jr. High School in Santa Barbara, CA. In the many years since that time Kelly has proven to be an honest, friendly, supportive and intelligent friend. She is someone you can count on to carefully consider options before making a decision. Kelly strives for the greater good—for people and our environment. I am thrilled to have Kelly King supporting the Maui that we love! Kelly King Pono Prosperity!" "I have every confidence in Kelly's ability to offer the people of Maui all they deserve and expect in a local government official! She is an inspiration!" "Very happy to hear that you are running for Maui County Council. We definitely need your pro-active true spirit with understanding of business challenges. YEA!!!" "Kelly will make an excellent councilmember. A smart and savvy businesswoman, Kelly will use her critical thinking skills to hold government accountable and protect the publics' interest. Her sense of justice, along with her energy and commitment, will be of invaluable service to all the people of Maui County." "For a few elections now we’ve happily endorsed Don Couch for County Council, but not this year. His recent agreement with Mayor Alan Arakawa’s plan to “suspend” all community plan updates because he believes the planning process is “broken” is ignorant and reckless. There is nothing wrong with the county Planning Department’s process of updating community plans, but there is everything wrong with political leaders who blame the “process” when their land developer cronies get sidelined by community plan updates. We need council members who trust community plans and agree to uphold them, and Kelly King fits that bill nicely." Long time Maui resident, Kelly King is the mother of two kids who graduated from Maui High School. Kelly and husband, Bob recently became grandparents. Kelly was the second oldest in a big family and learned responsibility early caring for her younger sisters. She attributes her childhood to learning responsibility at an early age and also becoming an advocate for those who cannot speak up. In California, Kelly experienced racism for the first time at 10 years old. A boy at school used a racial slur against her and that incident led to a conversation with her parents about the internment camps where they were both imprisoned by the U.S. government for being of Japanese ancestry. This is a poignant piece of her history that has shaped her determination to stand up for the less able and less fortunate. On Maui, Kelly worked in the tourism industry for a few years where she met her husband. Kelly King loves to SUP with her family which is why she is determined to clean up the sewage injection wells contaminating our water. I’m running for office because I believe it's our kuleana to step up and serve the community when the need arises. As an involved citizen, sustainability champion, local business owner, parent and advocate for children’s needs, I understand the balance required for smart growth and the responsibility of leadership for the greater good of our community. My bid for County Council is not a personal career goal, rather it is an opportunity to serve the people of Maui at the county level and stand up for transparent, responsive and efficient government. I offer a history of experience and collaborations with a wide variety of people from grassroots to state and federal elected officials. My campaign slogan – Pono Prosperity – sums up my vision for my role if elected. Doing the right thing goes hand in hand with public office. Our community values are expressed in our Community Plans, developed with extensive input, and these goals and values should be guiding all County Council decisions. We can have a better community if we focus on improving infrastructure, appointing proven and skilled department directors, helping the less fortunate and supporting small businesses and family farmers. Pono Prosperity means helping everyone. These two issues are at the core of sustainability, as they are the key resources for food and energy. Read more..."